We will understand the about the concept of producers and consumers. We know that green plants make their own food and they use only a part of this food for their growth. The rest of the food is preserved for animals. Thus the plants are known as the producers while animals are known as the consumers. The plant-eating or herbivorous animals eat the food preserved by the plants. So the herbivorous animals are the first order consumers. First order consumers depend directly on green plants for food. Herbivorous animals like elephant, camel, cow, buffalo, deer, sheep, goat, rabbit etc. are the first order consumers. 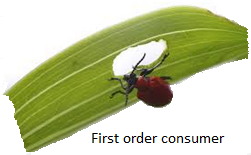 An insect eats green leaves so it is first order consumer. Some flesh eating or carnivorous animals eat flesh of the first order consumers or herbivorous creatures, for example, rabbit, goat, deer, sheep etc. So they are called the second order consumers. A frog eats insects, so it is second order consumer. Some carnivores eat other carnivore animals. There are some carnivores that eat up the second order consumers. They are termed as the third order consumers. A snake eats a frog, so it is third order consumer. Thus considering the plants and animals as producers and consumers we conclude that all animals depend directly or indirectly on green plants for food and animals help the plants to grow.